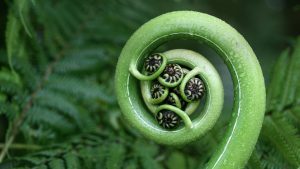 The Koru, or Fiddlehead plant, symbolizes peace, tranquility, strength, personal growth, positive change, and new beginnings. These are the fundamental elements from which Koru Family Psychology was built. The maternal bond between mother and calf is incredible. The level of care and tenderness between the mother and her baby is second to none in the animal kingdom. Further, the family and community are strong. When a baby is born, there is great fanfare and the baby is surrounded by mother, relatives, and other females from the herd. The baby remains the centre of attention for years, fussed and cared for with great devotion. Female helpers, or aunties, will watch the baby so the mother can have a break and reserve her strength for nursing. Babies have the best chance of survival with several aunties helping. 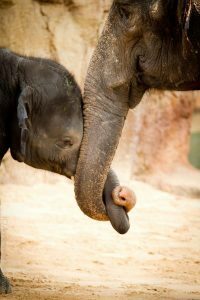 Females establish extremely strong bonds with their herd and the bond with their mother remains unbroken until her death. Over the years, baby elephants rely on others to survive and thrive. As they transition into adolescence, they often require alot of guidance and reassurance from their mother and aunties to grow into strong, confident, adult elephants. Koru Family Psychology focuses on building these strong bonds and confidence that are needed to thrive in life.